All smartphones do not depreciate equally. 18 months after purchase, iPhones can be sold for 53% of their original price, while Androids can only be sold for 42% and BlackBerries for 41% on average according to a study by Y Combinator second-hand price guide startup Priceonomics. That frown on Android fanboy faces gets even larger the quicker they try to resell. 12 months after purchase, iPhones can pull in 63% of their day 1 manufacturer suggested retail price, compared to 46% for Android. Early adopters who must have the latest model would do well to stick with Apple. 6 months after purchase iPhones claim 89% of their original MSRP, while Androids fall to just 66%. Priceonomics says “We examined all iPhone models and the 70 most popular Androids and 30 most popular BlackBerry models. iPhone is wiping the floor with Android and BlackBerry in terms of resale value.” This study doesn’t take into account the high, off-contract price of iPhones or the economical options for Android buyers. It’s based on hardware alone, doesn’t compare carrier charges, and may be skewed towards American resale values due to the location of Pricenomics’ user base. The numbers indicate enduring confidence in Apple hardware, and that a liquid iPhone resale market could make the device a wiser purchase. Carriers, on the other hand, aren’t doing so well selling the iPhone. Verizon, AT&T, and especially Sprint are seeing profits shaved down by subsidizing iPhone purchases, CNN Money repots. Some other interesting findings include that paying for extra memory hardly enhances resale value, breaking your contract and paying the termination fee is cheaper than buying off-contract, and pre-paid Android phones are cheap and hold their value quite well compared to contracted Androids. The lower resale value may make some Android models more expensive to own per month. Finally, Priceonomics composed some fanboy location indices showing where the highest volume of certain phones were being resold on its site. 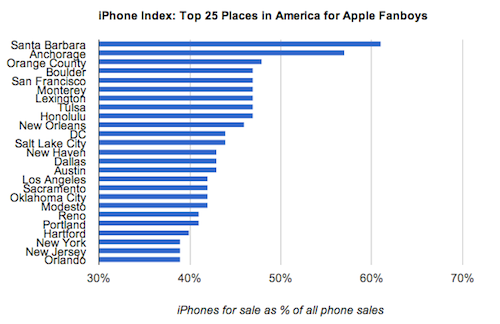 Long Island, New York, Miami, and New Jersey have the most BlackBerry resales , while Santa Barbara, Anchorage, Orange County, Boulder, and San Francisco see the most iPhones changing hands. Looks like the adages are true. Smug cities full of supposed cool kids love their Apple products, while bro’ed out popped collar-types are propping up RIM.